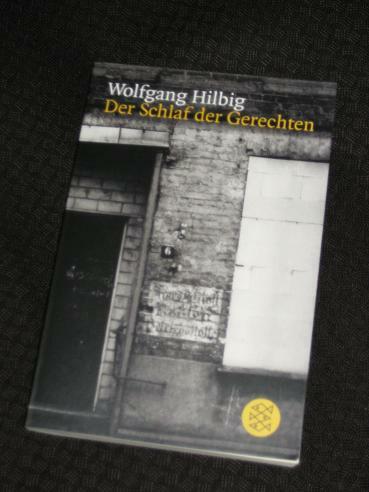 Der Schlaf der Gerechten (the Two Lines edition, The Sleep of the Righteous, is translated by Isabel Fargo Cole) is a collection of stories by deceased German writer Wolfgang Hilbig. Hilbig grew up just outside Leipzig, in what at the time was the German Democratic Republic (East Germany), but after a few run-ins with the authorities, he emigrated to the West in the mid-eighties. The stories in this collection are divided into two groups: the first brings together pieces reflecting on his childhood while the second has the adult writer returning to his home town to see how much (or how little) it has changed. However, all are linked by a sombre tone and a preoccupation with memories of the past. Der Frieden, das war deutlich, wurde von den Uhren beherrscht, die Uhrzeiten hatten die Macht übernommen, und sehr schnell war zu bemerken, daß man der Macht der in ordnung gebrachten Zeitabschnitten nicht mehr entging. Nevertheless, ‘Ort der Gewitter’ still describes a childhood very different to that experienced by most modern children. The young boy spends his days roaming the badlands on the other side of the tracks, learning to swim in the flooded open-cast mines (which are heated by the never-ending fires of left-over coal and peat…), avoiding the older boys who might cause trouble – and the Russian soldiers lurking in the background. It’s a wonderfully leisurely piece, a work which could stand proudly by itself, and the beauty of the story lies in its tone. Hilbig cleverly uses the haze of the summer days to reflect and perhaps obscure his hazy memories, and there’s a Proustian element in its use of smells and sounds to evoke memories, with the ever-present dust and the choking ash, waste from the winter fires, cloaking the scene. There’s an irony of sorts in the title as the storms crossing from the east tend to avoid the town, leaving the inhabitants waiting for the refreshing rain that won’t come until the summer is finally over. Schwitzend ruhen wir Seite an Seite, in einem alten Ehebett, und die quadratische Schwere der Finsternis liegt uns auf, umklammert uns, und sie preßt uns aneinander, mit einander ergänzenden Körpern liegen wir, zwei Verschwörern gleich, die sich mit ihren Atemzügen Zeichen geben. The second half of the book focuses on the writer-narrator as an adult, with all three stories taking him back to his home town. In ‘Der Nachmittag’ (‘The Afternoon’), the summer of his childhood memories gives way to cold and fog as the writer returns to a place time seems to have forgotten. This sense of time standing still is exacerbated by the broken station clock, still telling the same time as in an old photo the narrator finds, which then cleverly leads to a story of a man on the run – our first allusions to the infamous Stasi (State Police). A little less abstract is ‘Die Erinnerungen’ (‘Memories’), in which the writer suddenly recalls his old job as a stoker, and the old man he once worked with, on one of his morning walks. The two strands allow Hilbig to compare the town of his youth to the backwater he has returned to. These two are just a warm-up for the main act, though, introducing us to themes and ideas which will be used again in the final story, ‘Der dunkle Mann’ (‘The Dark Man’). This is a superb sixty-page novella beginning with a call from a mysterious stranger, who demands to meet the narrator to tell him something of interest. The irascible writer hangs up but is unable to get the incident out of his mind, and it’s little surprise when, on a trip to the East to visit an old friend, the man gets in touch again. Wie lang war inzwischen die Liste der Personen, die als prominent galten, oder die sich selbst für prominent gehalten hatten, und die nun plötzlich als Zuträger dieser Staatssicherheit enttarnt worden waren oder die sich, der Öffentlichkeit zuvorkommend, selbst enttarnt hatten, wodurch sie freilich noch prominenter geworden waren. Wolfgang Hilbig beschreibt Gerüche, Staub und Hitze so, dass der Leser riecht, schnieft, schwitzt und die letzten Seiten mit rußgeschwärzten Fingern umblättert.